The Russian Ground Forces have started to receive a modernized version of the Msta-S self-propelled artillery piece. The new self-propelled gun will be used in the interim until the much more modern 2S35 Koalitsiya-SV enters service in significant numbers. 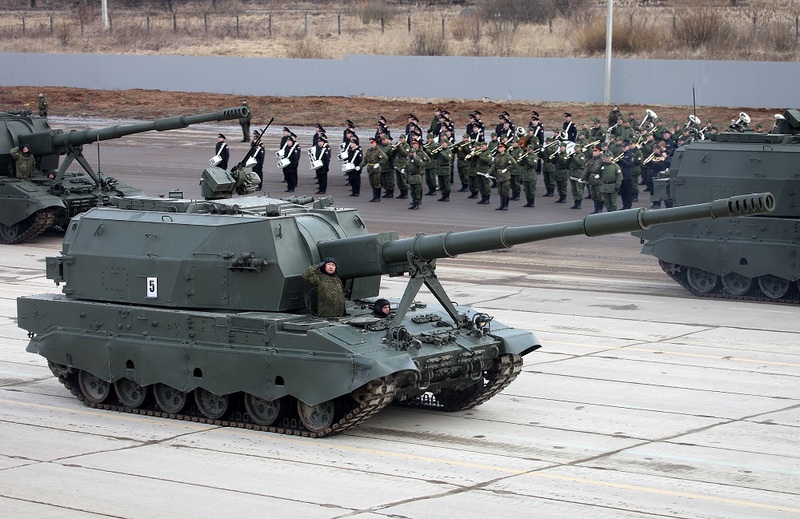 “Dozens of self-propelled artillery Msta-S entered into service in the military units of the 1st Tank Army in the Moscow region,” the Russian Ministry of Defense stated. The two units will exercise with the new guns later this summer. “The new hardware will take part in the combat firing of artillery of the 1st Tank Army, appointed at the final stage of summer training period,” the Russian MOD statements added. The new gun has an improved fire-control system and a host of other improvements over the basic Msta-S.
“The [MOD] authors made a minor mistake. The troops are now being equipped not with the basic Msta-S, but with an upgraded version, Msta-SM, with new fire control system and some other improvements,” Vasily Kashin, a senior fellow at the Center for Comprehensive European and International Studies at Moscow’s Higher School of Economics, told The National Interest. Researcher Mikhail Barabanov, editor of the Moscow Defense Brief—published by the Center for the Analysis of Strategies and Technologies—said that this new weapon is an updated version of the Msta-S, but the Russian Defense Ministry’s designation for the gun is not the Msta-SM. “The Msta-SM was 2S33 (2S19M), an old project. It was cancelled in favor of the 2S35 Koalititsya,” Barabanov said. Rather, the original Msta-S was designated as the 2S19M1 while this newer upgraded version is called the 2S19M2. However, as Barabanov explained, it retains the Msta-S designation. In any case, with the Koalitsiya-SV still some years away from mass production, the still-potent Msta-S will afford the Russian Ground Forces a modern artillery piece until the new weapon is fully operational. The Msta-S is built around a 2A65 152-millimeter howitzer that is capable of firing around eight rounds per minute. The new version will likely be able to fire faster because it is equipped with a new gun and improved loader. “These are the howitzers which are being produced before full scale production of Koalitsiya starts,” Kashin said. The Msta-S will eventually supplanted by the Koalitsiya-SV, which is built around a 152-millimeter 2A88 gun, and capable of firing 15 to 20 rounds per minute. The new gun will be in limited service by the end of the year, but it won’t be in regular service until sometime later in the next decade. “I think there was a statement about a limited number in service by the end of this year,” Kashin said. The introduction of Msta-S and the Koalitsiya-SV are a significant boost to the Russian Ground Forces’ artillery force. Meanwhile, the U.S. Army is expected to operate upgraded versions of the 1960s-vintage M109 Paladin self-propelled gun.